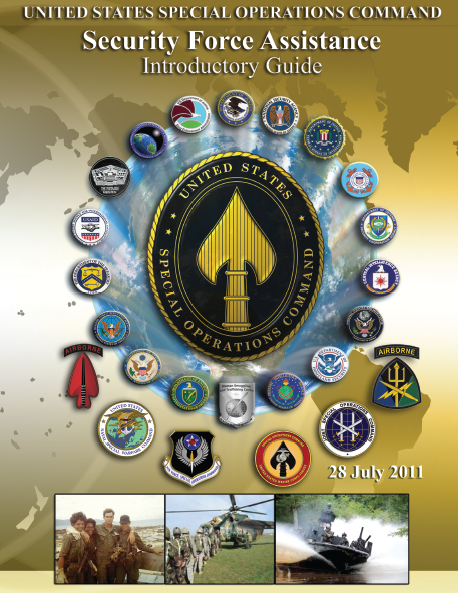 Although the U.S. Special Operations Command (USSOCOM) is the DoD Lead for SFA Doctrine, Education, and Training, both Special Operations Forces (SOF) and Conventional Forces (CF) participate in SFA activities. The primary role of both SOF and CF in SFA is to assess, organize, train, equip, rebuild, and advise PN military and paramilitary forces with tasks that require their unique capabilities. At times, this may require U.S. forces to temporarily assist the HN or FSF with these tasks until they can develop the requisite capability and capacity or until the current threat is reduced to a manageable level. Thus, SFA activities require the collective capabilities of SOF, CF, the civilian expeditionary workforce (CEW), and contract personnel to execute the mission. PNs may also need capabilities which are interoperable with the U.S. Government (USG). As a result, some SFA activities require interagency capabilities to execute the mission. Other USG agencies contribute their expertise in defense, law enforcement, government, infrastructure, and security capabilities to improve the PN ability to govern and defend against a common threat to security. A comprehensive assessment of an intended FSF mission, capability and sustainment requirements will determine the appropriate combination of U.S. forces needed to conduct SFA. Developing capabilities of FSF is not new for the U.S. military. From operations during the Philippine Insurrection (1899-1902) to the recent Operations of ENDURING FREEDOM, IRAQI FREEDOM, and NEW DAWN , the U.S. military has a long history of employing military advisors. Current U.S. policy reflects an increased emphasis on SFA as a primary activity to achieve U.S. security objectives. In Iraq and Afghanistan, for example, Soldiers, Sailors, Airmen, Marines, Coast Guardsmen, government service civilians, and civilian contractor personnel conduct security force assistance alongside multinational partners to develop the capability and capacity of FSF to meet their nations’ security requirements while supporting U.S. objectives. In Georgia in 2002, the DoD launched the Georgia Train and Equip Program (GTEP) with specialized SOF personnel. The goal of the program was to enhance the security capabilities of the Georgian Armed Forces, to improve interagency coordination between respective units, and to train military personnel. GTEP ended in 2004 with the graduation of the last group of Georgian soldiers; however, in 2008, the Georgian Ministry of Defense requested a renewed effort in the buildup of Georgian military units’ capability and capacity to enable the Republic of Georgia to assist North Atlantic Treaty Organization in Coalition Force efforts in Afghanistan. These on-going global advisory efforts, gleaned from lessons learned from past operations, will continue to guide the DoD into the future. SFA is one component of a unified action across the diplomatic, information, military, economic, financial, intelligence, and law enforcement (DIME-FIL) construct. SFA occurs across the range of military operations, takes place in any of the operational themes (peacetime military engagements, limited intervention, peace operations, irregular warfare, major combat operations), and may occur during offense, defense, and stability operations. Security Sector Reform (SSR). The set of policies, plans, programs, and activities that a government undertakes to improve the way it provides safety, security, and justice. The overall objective is to provide these services in a way that promotes effective and legitimate public service that is transparent, accountable to civilian authority, and responsive to the needs of the public. From a donor perspective, SSR is an umbrella term that might include integrated activities in support of defense and armed forces reform; civilian management and oversight; justice, police, corrections, and intelligence reform; national security planning and strategy support; border management; disarmament, demobilization and reintegration; or reduction of armed violence (DoS DoD USAID Handbook for SSR). Stability Operations (STABOPS). An overarching term encompassing various military missions, tasks, and activities conducted outside the U.S. in coordination with other instruments of national power to maintain or reestablish a safe and secure environment and to provide essential government services, emergency infrastructure reconstruction, and humanitarian relief (JP 3-0). Foreign Internal Defense (FID). Participation by civilian and military agencies of a government in any of the action programs taken by another government or other designated organization to free and protect its society from subversion, lawlessness, and insurgency. The focus of USG FID efforts is to support HN internal defense and development (IDAD). FID can only occur when an HN that has asked for assistance. Counterinsurgency (COIN). Comprehensive civilian and military efforts taken to defeat an insurgency and to address any core grievances (JP 3-24). COIN is primarily political and incorporates a wide range of activities of which security is only one. Unified action is required to successfully conduct COIN operations and should include all HN, U.S., and multinational agencies or actors. Civilian agencies should lead U.S. efforts. Ideally, all COIN efforts protect the population, defeat the insurgents, reinforce HN legitimacy, and build HN capabilities. FID-COIN Relationship. FID may or may not include countering an insurgency. When FID includes countering an insurgency, COIN is part of FID. COIN only refers to actions aimed at countering an insurgency whereas FID deals with subversion, lawlessness, and insurgency, individually or combined. In most cases, the joint force conducts COIN as part of a larger FID program supporting the HN government. U.S. involvement in COIN operations that are not part of FID is an uncommon, transitory, situation wherein the U.S. and multinational partners should work to establish or reestablish HN sovereignty. Unconventional Warfare (UW). Activities conducted to enable a resistance movement or insurgency to coerce, disrupt, or overthrow a government or occupying power by operating through or with an underground, auxiliary, and guerrilla force in a denied area. (JP 3-05) US-sponsored UW generally includes seven phases: preparation, initial contact, infiltration, organization, build-up, employment, and transition. The tactical actions of the Advisor are to develop capability and capacity within the indigenous or surrogate forces, which may or may not transition to long term sustainable capabilities, dependent on USG strategic objectives. SFA-FID-COIN-UW-STABOP Relationship. SFA is integral to successful FID and COIN operations. SFA includes organizing, training, equipping, rebuilding, and advising (OTERA) various components of security forces in support of a legitimate authority. The portion of SFA oriented towards supporting host-country efforts to counter threats from subversion, lawlessness, and insurgency is a subset of FID. SFA activities are conducted primarily to assist host countries to defend against internal and transnational threats to stability. However, unlike FID wherein the primary focus is to support the HN IDAD plan, the DoD may also conduct SFA to assist host countries to effectively defend against external threats; contribute to coalition operations; or organize, train, equip, and/or advise another country’s security forces and/or supporting institutions. The organize, train, equip, and advise tasks conducted by SOF during UW operations may be part of, or become, SFA activities when supporting an indigenous or surrogate force in support of a legitimate authority. Legitimacy is determined by the USG. As illustrated in Afghanistan and Iraq, conducting security force assistance activities are an increasingly critical element of building partner capacity. Comparison of SFA and FID. SFA supports the military instrument of FID, contributes to the legitimacy and eventual success in COIN, contributes to SSR/SSA, and is a subset of DoD security cooperation efforts. SFA is an element of USG building partner capability fully within the security sector. Still, the common misunderstanding about SFA is its similarities and differences to FID. In the conduct of FID, the military’s primary role lies in the security sector across both the military and civilian lines of effort. Many of the tasks in support of FID across the security sector can also be classified as SFA, but many of the tasks in support of FID will fall outside the scope of SFA as they will not specifically address capability or capacity within the HN security forces. All actions taken by U.S. military to support an HN IDAD plan are considered tasks within FID, but only those tasks that directly develop capability and capacity of the HN security forces will be SFA. Understanding that all SFA activities done in support of FID are a subset of FID, SFA activities can also be conducted in support of a HN to enhance external defense, in support of a PN to assist in activities in a third country, or in support of regional security forces or even indigenous forces in support of an insurgency.